I’m being very mean with my posting this week until I get the camera thing sorted. Of course I am also insanely busy, but who isn’t? I had a lovely time camping and enjoying some rain. There really has been a drought in the south-east, so it was good to see rain, even if it co-incided with a weekend of camping and outdoor workshops! But I was prepared and stayed dry and warm and am invigorated from being outdoors for 24 hours solid and hearing more bird song in one weekend than I hear in a week in Brighton. I spent today in working in London which was quite an unpleasant contrast! Last week I made a start on a couple of aprons. One for myself, to wear when running workshops – and one as a thank you gift for my favourite journalist! My own was finished in time for the weekend but the gift one had to wait for the purchase of yellow bias binding and I might save that for tomorrow! 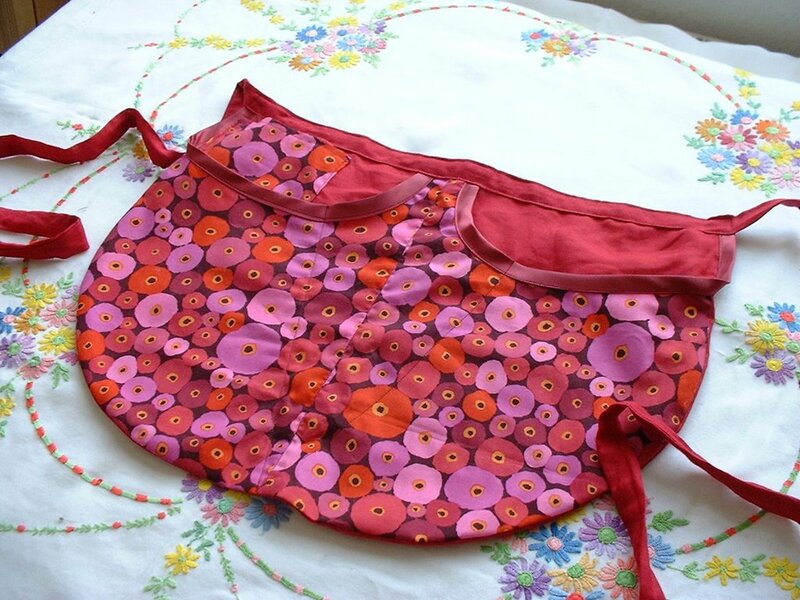 Mine is made from red linen and lovely Kaffe Fasset print – the scraps left over from making a dress. It’s the same pattern as the one I made from Tie One On in April, but with a few amendments. 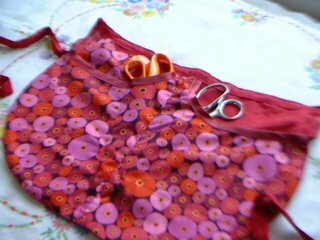 A tiny pocket on the right side for chalk and scissors etc, and two large scissor pockets in the centre. These are stitched in a V shape either side of the central seam. Does that make sense? So there are two V-shaped pockets in the centre. It worked really well and I will definately make more in this pattern. I fancy a money belt type for wearing to shows and fairs – same style but more secure pockets. And of course I will be a walking advert for my own wares, as always! The bottom photo shows what strangeness happened with my camera after I dropped it. Groovy special effects….